There are many ways to copy VHS tapes to DVD. For many individuals, converting VHS to DVD is an important process because it enables them to have better access to their stored memories and also helps to preserve the content that was recorded on VHS tapes. The VHS format has been around since 1976. A competing format, Betamax was introduced in 1975. Many memories of important events such as weddings, baptisms, graduations, vacations, other family events, etc., have been recorded on VHS tapes. The problem today is that tapes are degrading and some will need vhs repair. Most VHS tapes have not been stored ideally and so this simply accelerates the degradation of the tape and results in less time for action. Because blank VHS tapes are hard to find and new equipment is becoming scarce, the best option to preserve the memories recorded on this format is to digitize the video and when you copy VHS tapes to DVD, you are in fact digitizing the video. There are many ways of performing this task. One method is to use VHS to DVD recorders. These units contain a VHS player component and a DVD recorder component all in one single unit and to copy VHS tapes to DVD is a quite simple and straightforward process. Another method that can be used for converting VHS to DVD is to use a digital camcorder as the digital conversion device. The VCR is connected to the digital camcorder and the camcorder then connected to the computer. Using appropriate capture software on the computer, the VHS video after being digitized by the camcorder can be made into a DVD. This method also allows the VHS video to be saved in a different digital format other than DVD. When you copy VHS tapes to DVD the video is being compressed or in other words some information is being thrown out in the making of the DVD. This may or may not be visible in the final DVD product, but some people prefer not to compress the video and prefer not to make DVDs. If DVDs are not created, then much larger files are created and depending on the source material, the result may be of better quality. For many VHS tapes, it is debatable whether there would be an improvement because most VHS recordings are not of great quality. Nevertheless, this method of digitizing or converting VHS tapes does provide more flexibility in terms of a target end format. 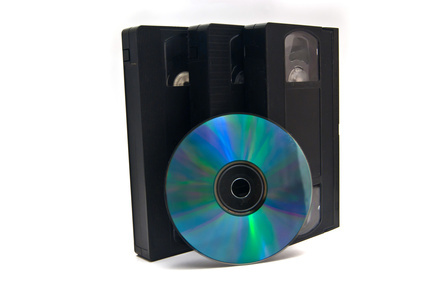 Converting VHS to DVD can also be achieved by using an external digital conversion box instead of the digital camcorder or a quality video card installed in your computer. Both of these options provide the same sort of flexibility as discussed above for the digital camcorder method. You can convert VHS tapes to DVD or to a different digital format, either compressed or uncompressed. Instead of converting to DVD some individuals convert the VHS video to VCD or Video Compact Disc. However, as discussed at this convert VHS to CD page using the VCD format will result in digitized video that is of poorer quality than the original analog VHS videotape. In any digitization or conversion process whether from VHS tape or other video format, the quality of the video signal being fed to the digitization device, whether it is a camcorder, a video card, or an external digitizing box, is very important. If a poor signal is being fed to the digitization unit then a poor quality converted video or poor quality DVD will be obtained. Therefore, it is important to optimize the video signal coming from the the video cassette recorder and to use the right output/input connections in order to get the best possible signal for the digitization unit to work with. A great advantage of digitization is that you can have easier access to the video content and moving forward is the only real option for preservation of the recorded video information, whether it is decided to copy VHS tapes to DVD or some other digital format. After converting the VHS tapes, it is generally a good idea to keep the originals. The reason is primarily based on the fact that in the future a better method to digitize the video may become available. However, this is the choice of the holder of the originals and space availability, future availability of the playback equipment, value of the content, etc. ; all are elements which factor into that decision. To store the tapes properly, the original VHS tapes should be properly wound prior to being stored long term. They should be stored in suitable storage containers and under the right temperature and relative humidity conditions. Note that copying material that is copyrighted may be illegal and so you should ensure that digitizing VHS video even if it is only for personal use is permitted.